That is a lovely photo. Who would have thought you could find a corner of Paris that looks like rural Wisconsin. Great shot! I love that sky. The clouds near the horizon could fit the image of the song, "Ole Buttermilk Sky". this really does look like a "country" photo. Very nice Eric. It's true—en dirait en plein campagne! Great colors! Everything looks very lush in this scene, too. Wonderful photo! It could be a scene from the rural Midwestern U.S. The clouds! Oh, those clouds! They look like they are swirling in the wind. And the sky is soooo blue! 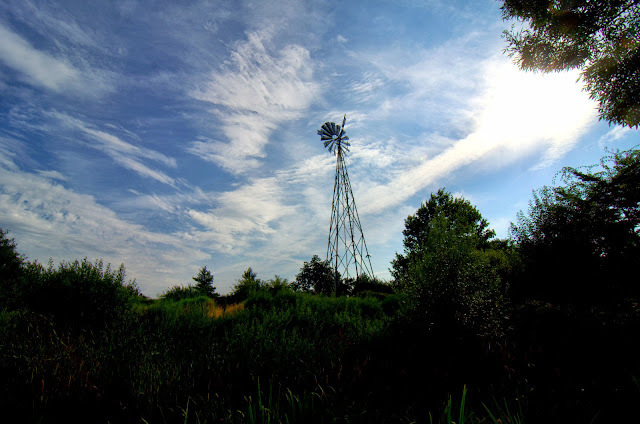 Oh yes, the composition is great for framing the windmill and sky with the trees. Hard to believe you can stumble upon this rustic rural-like scene in Paris! One thing for sure is you don't see anything like this on other "Paris" web sites. Kudos to Eric!